Busy, busy, busy – that is how I have been. Don’t get me wrong, I love to be busy. Shortly though I will be going on vacation and I am looking forward to that as well. I think there are some good and informative articles this month that you will find very helpful. Please remember that if there is something in particular you would like me to address for you, all you have to do is shoot me an e-mail and I will be happy to accommodate you if I am able. Please remember to be kind to others. Tomorrow is not promised. Until next time enjoy your summer and take care! If you would like to place a blank line before your table, how you do so will depend on where your table is located in your document. This might sound a little weird, but that is just how Word works. If your table is the very first thing in your document, all you need to do is click Ctrl+Home to position your cursor at the left side of the first cell of your table. Then click Enter. Word will place a blank line before your table. This will only work if your table is the first thing in your document. 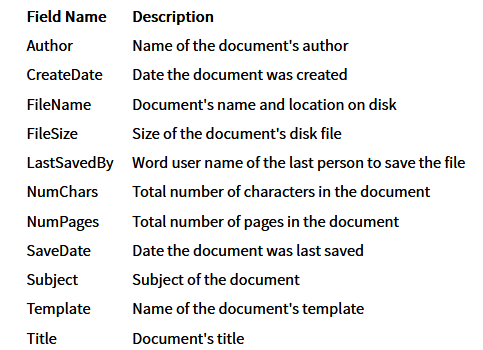 If you try this with a table that is anywhere else in your document, Word will simply add a new paragraph within the first cell of your table. To place a new blank line before the table, you will have move to the end of the paragraph just before your table and click Enter. You are not clicking Enter in your table; you are clicking it just before your table. Click Ctrl+Home to position your cursor in the first cell at the beginning of your table and document. Click Enter. A blank line (paragraph) will appear before your table. Your cursor is on the blank line. Click the Down Arrow to again position your cursor at the beginning of the first cell of your table. Click Enter. A new paragraph is added in the first cell. Delete the new paragraph added after step 2 above. Most folks I know use the Center tool in the Paragraph group on the Home tab of their Ribbon to center their paragraph. While this is quick and easy enough, I am one of those people who do not like to move my hands from the keyboard to the mouse to accomplish this. I just find it quicker and more efficient to just use my keyboard to accomplish this. So, if you are like me and would to center a paragraph using your keyboard, triple click your paragraph and simply click Ctrl + E. The paragraph in which the cursor is located will now be centered. I hope you find this shortcut helpful as well! 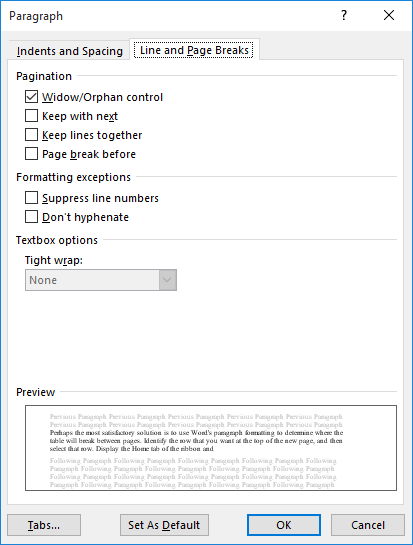 Word has a full-featured footnote system that will allow you almost total control over where and how your footnotes are printed. 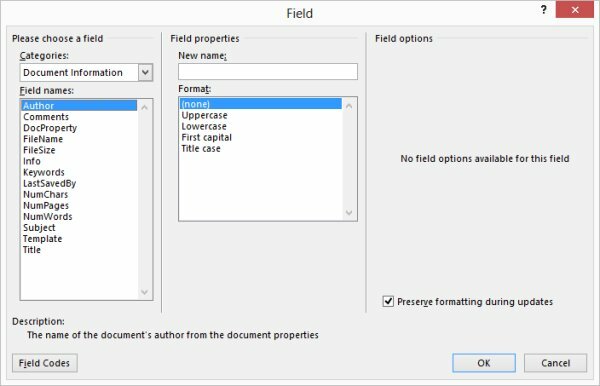 If you have inserted footnotes into your document previously and you would like to duplicate one of those footnotes, you can use employ the tried and true copy and paste functions. Highlight the footnote reference mark in your document. Click Ctrl+C to copy your footnote to the Clipboard. Place your cursor at the location where you would like to paste the footnote. Click Ctrl+V. The footnote reference mark is now inserted in your document, and the associated footnote is added to the footnotes section. If you are using auto-numbered footnotes, all the footnotes in your document are renumbered contiguously. Just use Ctrl + X in step 2 in place of Ctrl + C.
Word will allow you to assign specific key combinations to macros and commands. 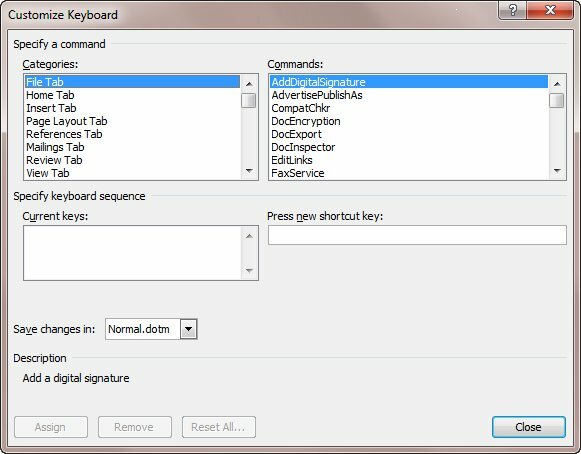 These key combinations are called shortcut keys, and when they are used, they will execute the command or macro. Display the Word Options dialog box by clicking on File | Options. At the left side of the dialog box, select Customize Ribbon. Click the Customize button at the bottom of the dialog box, just to the right of the words Keyboard Shortcuts to display the dialog box. In the Categories list, select Macros. In the Macros list, select the macro you want assigned to the shortcut key. Click once in the Press New Shortcut Key box so that your cursor appears there. Click a keyboard shortcut you would like to use to run your macro. You will know if the shortcut is in use because when you click it, you will see in the dialog box if the shortcut is being used by a different command. Click Assign. The shortcut is now assigned to the command. Repeat the steps above for each change you would like to make. Suppose you have a custom footer that you would like at the bottom of all the pages in your worksheet. Left-justified in the footer, you would like the full path name for your worksheet, and centered you would like a page number in the format of Page X of Y. Because a full path name can be kind of long, it is possible that the path will overprint the page indicator. Clearly this is not something you want to do. A better solution would be to push the page number down a line, so that it prints on its own line. Click the Page Layout tab of your Ribbon. Click the small icon at the bottom-right of the Page Setup group to display the dialog box. Be certain the Header/Footer tab is displayed. Click Custom Footer to display the dialog box. With your cursor in the Left Section area, click the folder tool. The code &[Path]&[File] will appear in the Left Section area. With your cursor in the Center Section area, click Shift+Enter to move to the next line, then key in Page followed by a space. Click the page number tool and key in of and click the Pages tool. The Center Section area will now contain “Page &[Page] of &[Pages]”, with a blank line before it. Close all the dialog boxes by clicking OK. When you print your worksheet, you think that the Shift+Enter keystroke (step 6) should move the center section of the footer down by a line. Unfortunately, it will not—Excel ignores the keystroke and places the center section of the footer on the first line, where it is overprinted by the left section of the footer. 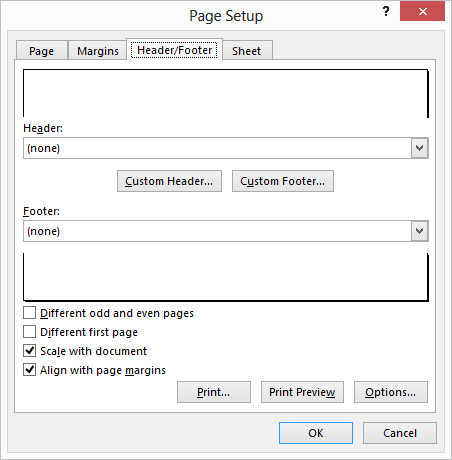 Ce certain the Header/Footer tab is displayed. Click the Custom Footer button to display the box. Make sure that all the sections of the footer are cleared and have nothing in them. With your cursor in the Left Section area, Key in what you see below , just as you see it. Make sure that you split the lines by clicking Shift+Enter at the end of the first line. Note the inclusion of the &C code at the beginning of the second line in step 6 above. This tells Excel that everything after it should be centered. The cool thing about doing the footer this way is that Excel, if necessary, will move down a line in order to print the centered information. If it can print the left portion of the footer on the same line as the center portion (the part after &C), then it will do so. Is There A Shortcut To Use To Get Back To Text? One of my subscribers recently asked me if when he finishes keying in a footnote or endnote in Word, is here a way to jump back into the text of his document using his keyboard instead of his mouse. There are actually a couple of ways you can do this. As far as I know, there is no dedicated keyboard shortcut to return to your text once you are in a footnote or endnote. Some folks use Shift + F5 (or Ctrl + Alt + Z) for this purpose. This shortcut cycles through your last several edit locations. When you are typing in a footnote or endnote, this means that it will take you back to your previous edit location, which is typically where you inserted the footnote or endnote reference. However, this will not always be the case, as you may have jumped into your footnote or endnote directly from the body text by clicking within the note. In that case, Shift +F 5 will take you back to wherever you were previously editing your document. Select the paragraph or paragraphs you would like affected by the formatting change. If you want the change to a single paragraph , you can simply make sure your cursor is within that paragraph. Make sure the Home tab of the Ribbon is displayed. Click the small icon at the bottom-right of the Paragraph group to display the dialog box. Make sure the Keep Lines Together check box is selected. Word keeps a summary of information for your documents. You can use this summary information, or you can ignore it. Some of the summary information is automatically stored for you, while other parts will need to be entered manually. One of the pieces of information maintained is the author of a document. This is, by default, set to be the Word user name, but you can change the author name at any time. Word will allow you to insert summary information (i.e., author name) directly in your document, and have it updated automatically if you ever change the information. Place your cursor where you want the author name inserted. Display the Insert tab of your Ribbon. In the Text group, click the Quick Parts tool and then select Field to display the Field dialog box. From the Categories list select Document Information . Select Author from the Field Names list. You should be aware that not all of these fields can be inserted by selecting the Document Information category. CreateDate and SaveDate are instead inserted by first selecting the Date and Time category.